Product prices and availability are accurate as of 2019-04-23 10:45:11 PDT and are subject to change. Any price and availability information displayed on http://www.amazon.com/ at the time of purchase will apply to the purchase of this product. Eggplant - Fairy Tale Hybrid. Latin Name: Solanum melongena. Patented Hybrid. AAS Winner for 2005. New miniature eggplants are white with violet/purple stripes. The fruit are non-bitter, with a tender skin and few seeds. The elongated, oval eggplants can be picked when quite small at 1-2 oz or left on the plant until double that weight and the flavor and tenderness remain. The petite plant reaches only 2.5 ft tall and wide and adapts well to container gardening. 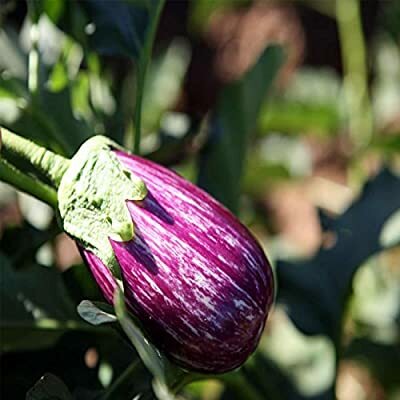 Mountain Valley Seeds carried these Eggplant seeds in a variety of sizes including both retail and wholesale prices.